Columbus-based Crimson Cup Coffee & Tea is one of 100 Dream Big Blue Ribbon Award winners recognized by the U.S. Chamber of Commerce. The coffee roaster is the only central Ohio winner and one of only three Ohio companies to be honored. We’re honored and gratified to be among the nation’s Blue Ribbon small businesses. This award recognizes Crimson Cup's business growth and community contributions over almost 25 years. 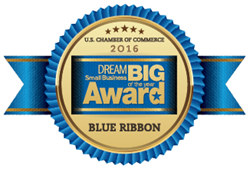 Columbus, Ohio coffee roaster Crimson Cup Coffee & Tea has been selected by the U.S. Chamber of Commerce as a 2016 Dream Big Blue Ribbon Award winner. Crimson Cup was the only winner from Columbus and one of three from Ohio to win the award, which recognized 100 U.S. companies for their "success and contributions to America's economic growth and vitality." “We’re honored and gratified to be among the nation’s Blue Ribbon small businesses,” said Founder and President Greg Ubert. “This award recognizes Crimson Cup's business growth and community contributions over almost 25 years. "Our ongoing success is made possible by everyone in the Crimson Cup Community – from our central Ohio cuppers to the small farmers who grow our coffee and the community of thriving independent coffee shops and specialty grocers across 29 states and internationally who distribute our coffee to consumers." The Blue Ribbon winners were selected from a record number of applicants from across the country. Businesses were judged in four key categories: strategic planning, employee development, customer service and community involvement. “These Blue Ribbon Award winners have worked hard, taken risks, and achieved success, helping strengthen their communities and local economies,” said U.S. Chamber President and CEO Thomas J. Donohue. Crimson Cup is also vying for the Community Excellence Award, which recognizes one Blue Ribbon business that has found notable success in the eyes of its community. The winner will be decided through online public voting to take place February 18 through March 4, 2016. Supporters can cast their votes on Crimson Cup’s page on the U.S. Chamber of Commerce website. Crimson Cup’s operations stretch from its Columbus, Ohio headquarters across the United States to coffee-growing countries in Central and South America, Africa and Asia. The company imports and roasts nearly half a million pounds of sustainably sourced specialty and craft coffee annually. Within the past year it has opened a new, 20,000-square-foot roasting and distribution facility at 1925 Alum Creek Drive and a 7,000-square-foot Innovation Lab at 700 Alum Creek Drive in Columbus. The company teaches entrepreneurs to run thriving independent coffee houses through its 7 Steps to Success coffee franchise alternative program. Based on Ubert's book, Seven Steps to Success: A Common Sense Guide to Succeed in Specialty Coffee, the program has launched hundreds of independent coffee houses in 29 states. A dozen or more new shops open each year. On March 9, the Chamber will announce seven regional finalists from among this year’s Blue Ribbon Small Business Award winners. Crimson Cup and the other Blue Ribbon winners will be honored at the 12th annual America’s Small Business Summit, which will take place June 13-15 in Washington, D.C. During the summit, one regional finalist will receive the DREAM BIG Small Business of the Year Award and a $10,000 cash prize. This is the third recent award for Crimson Cup. It was named 2016 Macro Roaster of the Year by Roast Magazine and 2016 Ohio Small Business of the Year by the Ohio Made Awards. Columbus, Ohio coffee roaster Crimson Cup Coffee & Tea is Roast magazine’s 2016 Macro Roaster of the Year. Since 1991, Crimson Cup has roasted sustainably sourced specialty and craft coffee in small batches. The company also teaches entrepreneurs to run successful coffee houses through its coffee franchise alternative program, which includes a coffee shop business plan. Crimson Cup coffee is available through a community of more than 350 independent coffee houses, grocers, college and universities, restaurants and food service operations across 29 states, Guam and Bangladesh, as well as the company’s own Crimson Cup Coffee Houses. To learn more, visit crimsoncup.com.